Bojana Pejic was born in Belgrade and studied art history at the University of Belgrade. Since 1991 she has lived in Berlin and is now working as a freelance art critic and curator. Her articles are published regularly in art periodicals including Artforum, Art Press International, Siksi, neue bildende kunst, zitty (Berlin) and New Moment (Belgrade). She was the chief curator of the exhibition After the Wall: Art and Culture in Post-Communist Europe organized by the Moderna Museet, Stockholm (1999), which traveled to Budapest and Berlin (2000), and co-curator of the exhibition The Reinvention of the Balkans in Kunsthalle Fridericianum, Kassel (2003). She held the Rudolf Arnhem Guest Professorship at Humbold University, Berlin (2003). Art that is “public” participates in, or creates, a political space and is itself a space where we assume political identities. The comedy The Mariensztat Adventure (Przygoda na Mariensztacie, 1953) is certainly not one of Leonard Buczkowski’s greatest achievements; if it weren’t the first Polish color film it might well have been forgotten in the history of Polish cinematography. Nevertheless, ever since I first saw it on TV Puls↓ 1 some years ago, this movie has been my favorite Polish film. 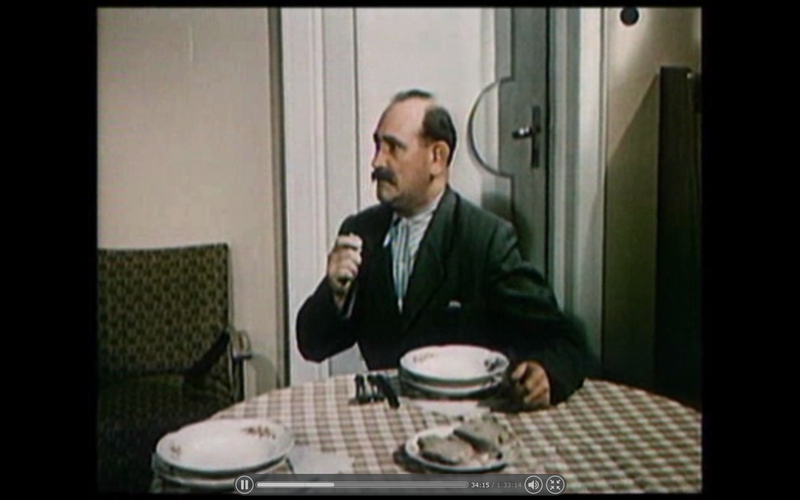 Considering the fact that all the post-socialist democracies treat the multi-party political space as a forum in which men conduct business and exchange political opinions (for example about women), The Mariensztat Adventure presents a rather disturbing picture. The film depicts women as as neither mothers nor whores — a vision of femininity that is unimaginable in post-Socialist cinema, and one which many contemporary male viewers who enjoy the privileges that have accompanied the “building of capitalism” might find quite nightmarish. 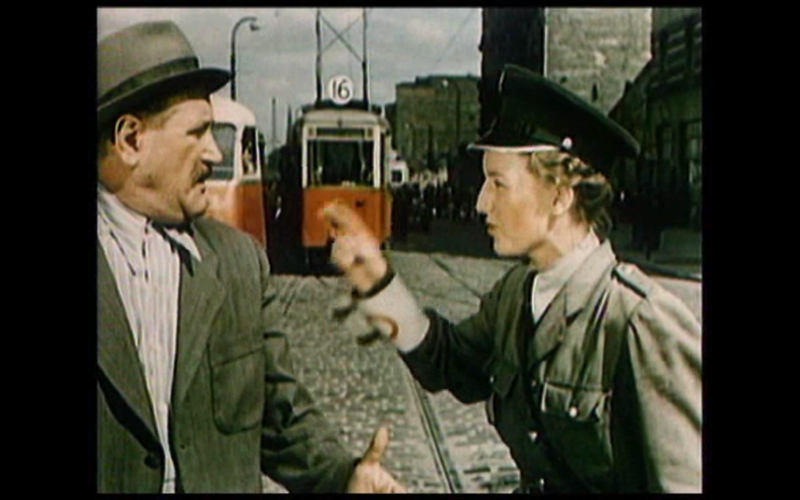 The Mariensztat Adventure includes a memorable sequence in which two male workers, who are generally nice and simple-minded guys, decide go to the director of the firm to complain about some irregularities caused by their co-workers from the women’s brigade. The men go out to the street and find that the traffic is as busy as in, say, New York (quite incongruous for Poland of the early 1950s! ); it turns out that the city has been taken over by various women’s brigades. Not only that, but the officer in charge of the traffic is also a woman — and so is the tram driver. The main characters notice that the other men in the street seem to regard this whole situation as normal. When they reach the firm’s head office, they first encounter the director’s secretary (and here they are of course not surprised — under Communism, like in capitalism, this post was considered female). When, waiting for the boss in the director’s office, they again encounter a woman, they are genuinely shocked to discover that she is not just an assistant — she is the director herself. This alarming sequence in which men suddenly become aware that women are everywhere was produced in a period when life in Poland (and elsewhere in Soviet bloc) had become, as Stalin put it, “jollier”. In stating this, he did not, however, have comedy or musicals in mind; these were not favored genres during the era of Stalinization. Upon Stalin’s death, musical comedy was virtually banned in the Soviet Union as well as in its satellite countries. Communism, as is well known, took itself rather seriously, and during the Cold War, for comrades in Mosfilm and their counterparts in Sofia, Bucharest or Warsaw, Communism was not a laughing matter. 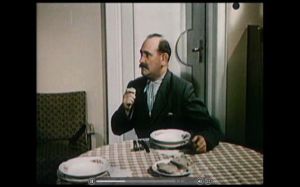 Through the “light” genre of comedy with elements of a musical, Buczkowski (who is, by the way, praised for his serious films) approached one of the primary and earnest aspects of the “new” Polish society — the equality of men and women — treating many of the acute problems associated with its implementation in an entertaining and humorous way. Even so, his film fulfilled its educational role, as seriously “engineered” films of this period were supposed to do. 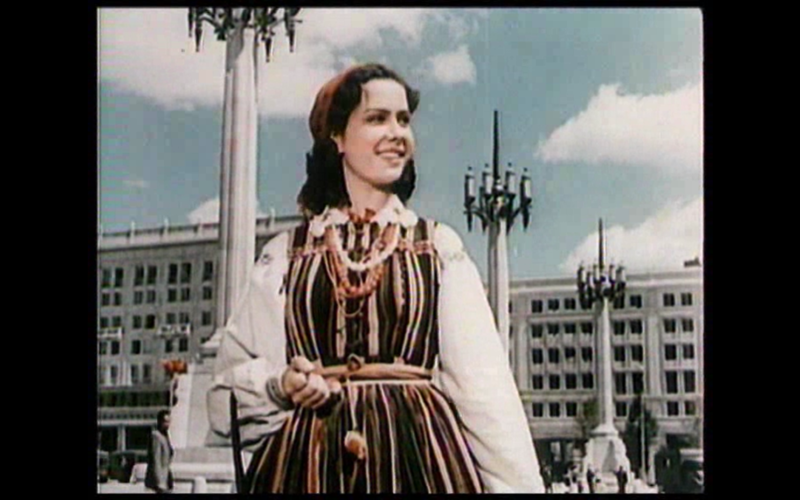 (played by Lidia Kosakówna), a peasant girl who first comes to Warsaw with a folklore troupe (whose members are appropriately dressed in colorful folk costumes). Their brief stay in Warsaw starts with a visit to the city’s historical monuments. Not especially interested in the past, Hanka goes off on her own and tries to discover the Warsaw of today — and what she finds is a city undergoing complete reconstruction (following its devastation during the war, which is presented in a short sequence at the beginning of the film). In addition to this discovery, she also meets Janek. She soon decides to move to Warsaw, and after the necessary training she becomes a member of a women’s bricklaying brigade. The film thus signals two modes of women’s emancipation in Poland, which were also the forms of “new femininity” that were most needed all over the Eastern bloc, including Yugoslavia (a country that evaded Stalin’s control in 1948). The first is the transformation of a country girl who joins the working class: a shift from the rural to urban and it also implied a breaking of the traditional bond between a woman’s body and Mother Earth.↓ 4 The other mode of emancipation lies in a woman becoming a construction worker — a job traditionally held by men, not only before but also during the Communist era. For many men — including some Polish Workers Party members — the metamorphosis of women was truly new. 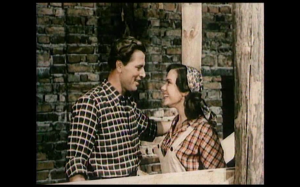 The film points out the “gender problems” that arose in the newly restructured society by treating men of the “old school” (represented by our two workers) with benevolent humor: Even though they initially lack the state-promoted “gender consciousness”, they are later able to alter their prejudices and, finally, accept the change. As far as the women’s brigade is concerned, it seems that freshly emancipated girls had a dual task: As bricklayers, they were “building Socialism” along with the men, and even smiling as they did it; ↓ 6at the same time, they had the job of emancipating the emancipator. In contrast to real life, in the film this proved to be possible. The Mariensztat Adventure, especially the sequence in which the city is conquered by the New Polish Women, seems to be restaged in Fellini’s City of Women (1979), except that the former is not a misogynistic film and the latter is. Lest this observation should seem to reek of nostalgia for Communist times, I hasten to note that although Socialist Realism did not allow any misogyny, it did not tolerate feminism either. In the sixty-year history of state Socialism, from Lenin to Gorbachev, from Beirut to Jeruzelski, feminism has always been considered an import from the capitalist West: It was there that working women had to fight for their rights, and when doing so, were sometimes accused of being leftist (i.e. Communist). This view is reflected in one of Jenny Holzer’s declarations, issued in 1988, at the last stage of Cold War: “If you had behaved nicely, the Communists wouldn’t exist.” Instead of feminism, women under Socialism had — or rather were given — “our” equality, and we were told daily that in “our” Socialist setting men and women enjoyed equal rights, that they could perform same jobs equally, and receive equal salaries. 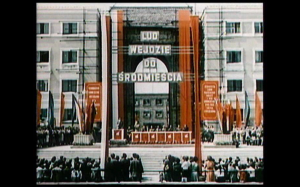 Today The Marensztat Adventure appears to be a propaganda piece “illustrating” Communist ideological goals.↓ 8 The assumption is that a romantic comedy (complete with singing workers!) 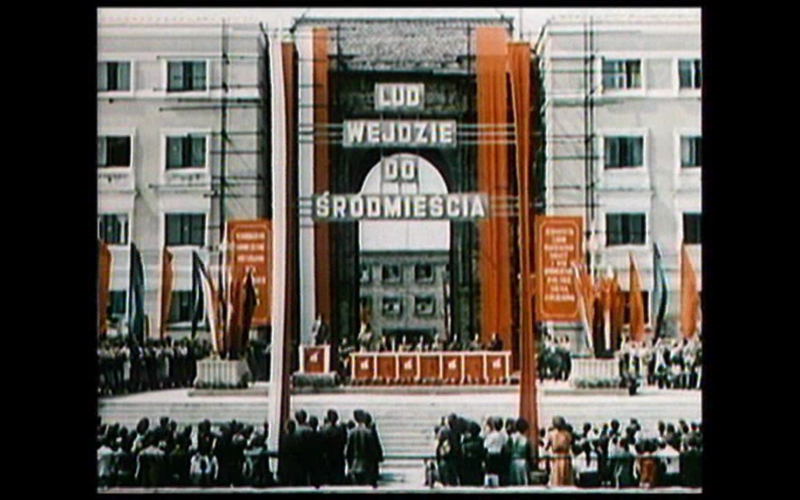 must have been more appealing to contemporary viewers than many of the serious films advertising the new power of Communism in Poland. But far from being an “illustration” of ideology, visual representations — including feature films — are the very medium where certain ideologies constitute themselves. Ideology is not just something that comes from the outside, from some remote power center that imposes certain values. Socialist culture, which wanted to change the “old world” and to introduce “progress” (such as egalitarianism, for example), preserved many patriarchal values. These old/new values were not fixed beforehand; rather, the mass medium of film is a part of the process of establishing these values.↓ 9 Thus, film (along with other artistic media) constructed the “new Socialist femininity”, and “new Socialist masculinity” as well. 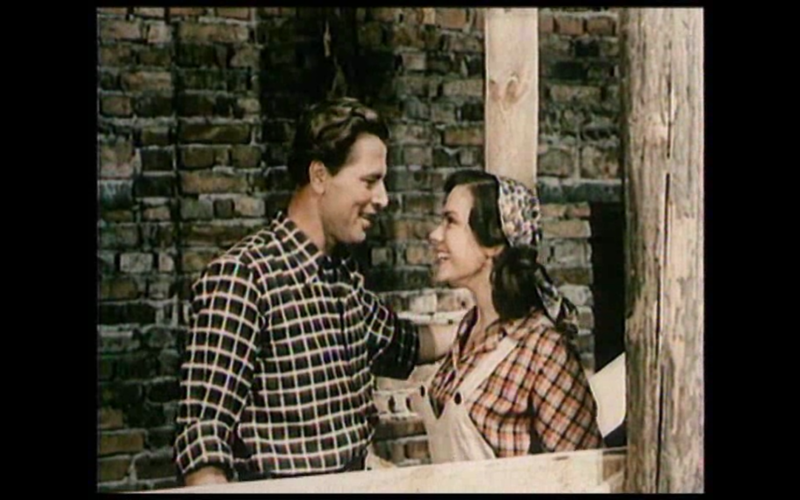 Hanka, the peasant girl who became a bricklayer, falls in love with a fellow worker — but not just any fellow worker; the one who has earned the special Socialist title “Hero of Work”. How are we to define the public sphere in general? How we understand the public space in a post-Socialist setting? To whom does the public sphere belong? How is it used, and, more importantly, by whom? When we use the phrase public sphere, we certainly presume that there exists another, “non-public” sphere. Many authors (not necessarily feminists) who deal with this issue have noted that, historically speaking, the public sphere has been conceived of as menspace, whereas the private sphere has been reserved for women. It was long presumed that women construct their identity “best” at home, where they can perform their prime role: maternity. In other words, women could not take part in the public sphere. Even though women have gained considerable rights since the end of the 19th century, the prime figure of modernity (at least in the Baudelairean/Benjaminean reading) is the flâneur, the man who appropriates the city by seeing and walking; early modernity does not know of flâneuse. Following the Great War, during which so many women started to perform jobs traditionally reserved for men, many countries introduced voting rights for women; women’s suffrage became widespread after the Second World War. Those countries that had (willy-nilly) practiced even instituted egalitarianism, a progressive and anti-patriarchal act.